At Bartholomew, we are aware that some of our students have caring roles at home and that being a Young Carer can have a significant impact on their lives academically, socially and emotionally. We believe that all young people should have equal access to education, regardless of what is happening at home. When a young person looks after somebody in their family who has a disability, mental or physical ill-health or substance misuse problem, they may need a little extra support to help them get the most out of school. At Bartholomew we work hard to: identify Young Carers; ensure they feel valued and supported; and improve the support they receive, both in school and in the community, to enable them to be safe, secure and successful. 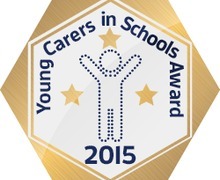 In 2015 we became the first school in Oxfordshire to be recognised nationally for our work with Young Carers when we received the Young Carers in Schools Gold Standard award.